As the long summer days are coming to a close, we welcome a new season: back to school. And when we’re back to school, we know it’s back to busy. Let the Bagel Bakery make your transition a little easier. Our Bag O Bagels is a great way to make for a quick, easy breakfast for hectic mornings. Simply pop in the toaster, and spread with cream cheese, or even peanut butter and banana slices for protein boost. 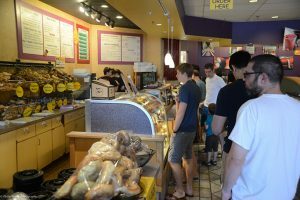 For all of you University of Florida or Santa Fe students, the Bagel Bakery is a great place to do homework or work on group projects together. Studying is infinitely more fun with a delicious bagel. Or, take a study break, relax and enjoy the atmosphere. You deserve it!